Your home is your fortress and your inner world in which you find peace, comfort and peace of mind. The atmosphere of warmth, comfort and harmony that you receive from competent and professionally made interior renovation of your apartment depends on the creation of comfort in your home. 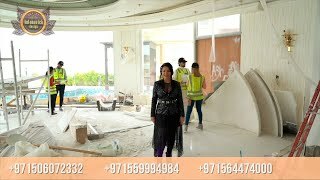 Apartment renovation is a difficult event, the subtleties and nuances of which need to be trusted only to professionals whom our company Luxury Antonovich Design offers you to provide fit-out services for the repair and decoration of apartments, cottages and any other premises around the world. — are supervised by a foreman and designer — the project developer. Mandatory element of the elite renovation and interior fit-out of Luxury Antonovich Design is the individual design of the premises. This is not only the use of exclusive fit-out materials and decor items, but also a unique interior, thought out to the smallest detail in terms of comfort and aesthetics. Each room is made in a single design key and looks complete. Our company takes the fit-out process very seriously — when all surfaces (walls, ceilings, floors, slopes) are prepared, their elite fit-out with modern exclusive materials begins under the supervision of Katrina Antonovich — the chief architect and designer of the Luxury Antonovich Design Company. Designers, craftsmen and artists work in tandem on the implementation of complex panels, mosaics, paintings on the walls, stucco ceilings, patterns of marble or parquet on the floor. Classic, modern, hi-tech or minimalism — the style is chosen by the client. The interior space of the high-end interior by Luxury Antonovich Design is filled with the best interior items, home appliances, lighting and sanitary ware of famous brands from leading manufacturers from Italy, Spain, France, England, Germany and the USA. The interior uses natural fit-out materials of the highest quality, stylish and elegant custom furniture, as well as complex elements of decor. Throughout the repair, the specialists provide project support, equipment selection and object assembly.